Scunthorpe have signed Burnley midfielder Kevin McDonald on a one-month loan deal and free agent Paris Cowan-Hall until the end of the season. McDonald has been out of favour at Turf Moor having only made one substitute appearance this season, when he scored in the Carling Cup against Morecambe. 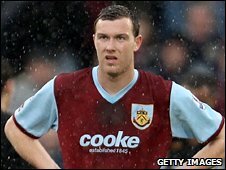 The 21-year-old Scot has played 64 games for the Clarets since moving from Dundee for £500,000 in June 2006. Striker Cowan-Hall, 20, was released by Portsmouth in the summer. The former Grimsby loanee has had trials with Burnley, Hull, Brighton, Derby and Oldham since leaving Pompey.